Ametrine is a name that describes a stone that is both Amethyst and Citrine, or purple and yellow, in one stone. Obviously, the "Ame" is from Amethyst, and the "trine" is from Citrine. It is a very clear, clean bi-colored quartz stone that occurs naturally---but rarely. It is formed naturally when quartz (with high iron impuries) is partially exposed to heat while parts remain cool. In other words, a quartz crystal that is exposed to two extreme temperatures at the same time results in Ametrine. Currently it can be found in one mine in the world---the Anahi Mine in Bolivia. Prior to the Anahi find, there was Ametrine found in the Rio Grande de Azul Mine in Brazil, but the Anahi Ametrine is a much higher quality gem. Ametrine will display both a beautiful golden yellow and rich purple hues, with both colors complimenting each other nicely. 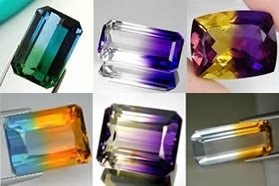 There are many variations in shades, but Ametrine is always yellow and purple. 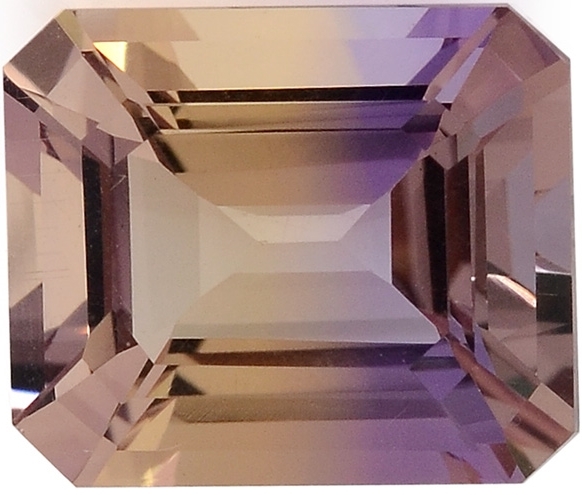 Genuine Ametrine would exhibit a "blend" of the color tones, and not a distinct "line" of color (see the picture right) or not in an "ombre" effect (see left). It can be faceted and cut into many shapes, but a rectangular (like emerald cut or radiant) cut really shows off the stone the best. 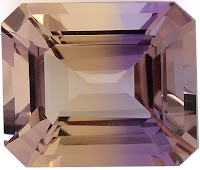 A seven-carat stone is considered the ideal size to showcase the clarity and colors of the Ametrine the best---lower than five carats is not recommended. 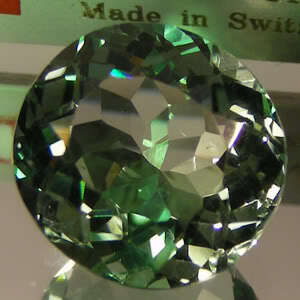 It is a hard gemstone and works well in jewelry worn on a daily basis. Aquamarine? 7.3 carats for $6.99? The answers provide a LOT of great information about gemstones and is very educational! Special thanks to "Shandroid" who was the victim of the crazy ranter, after bravely confronting the fraudulent seller! It's nice to see such beautiful, natural gemstones that are hand-set by a fabulous artisan! AND it's so nice to find a very trustworthy seller!